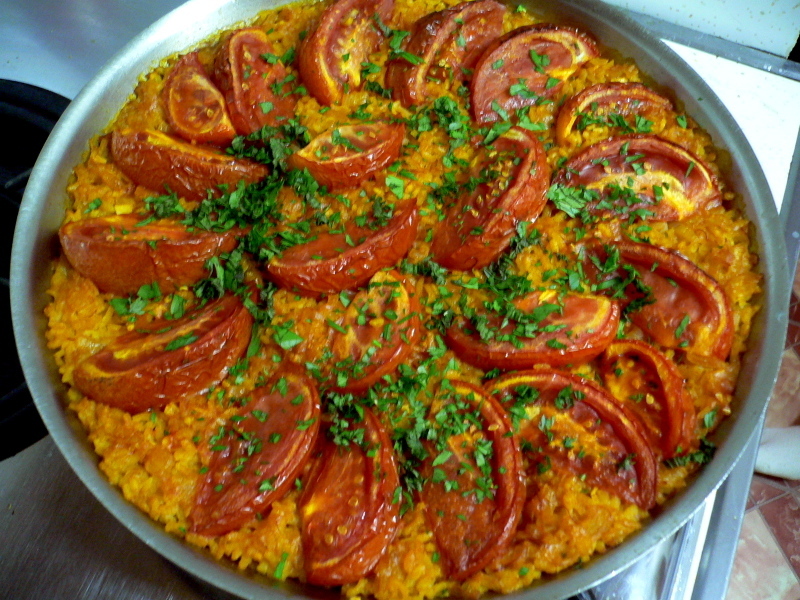 Plump Bomba rice, ripe tomatoes, heavy with juice, spiky and fragrant saffron, smoky, powdery pimenton, a splash of wine and blistering oven heat - all of these things add up to a white flag, waved by yours truly. The minute I laid eyes on it, I knew I was a goner. Who would be able to resist its allure? The rice, soft, chewy and crisp; the tomatoes, blistered at the edges and pulpy-sweet at their centers. To be honest, I'm a bit at a loss for words. In the end, I'm not sure there's much else to say, other than to admit that I'm completely smitten. And, you know, I think I'll just leave it at that. 1. Preheat oven to 450 degrees. Warm water in a saucepan. Put tomatoes in a medium bowl, sprinkle with salt and pepper, and drizzle them with 1 tablespoon olive oil. Toss to coat. 2. Put remaining oil in a 10- or 12-inch ovenproof skillet over medium-high heat. Add onion and garlic, sprinkle with salt and pepper, and cook, stirring occasionally, until vegetables soften, 3 to 5 minutes. Stir in tomato paste, saffron if you are using it, and paprika and cook for a minute more. Add rice and cook, stirring occasionally, until it is shiny, another minute or two. Add wine and let simmer until it is mostly absorbed, then add the hot water and stir until just combined. 3. 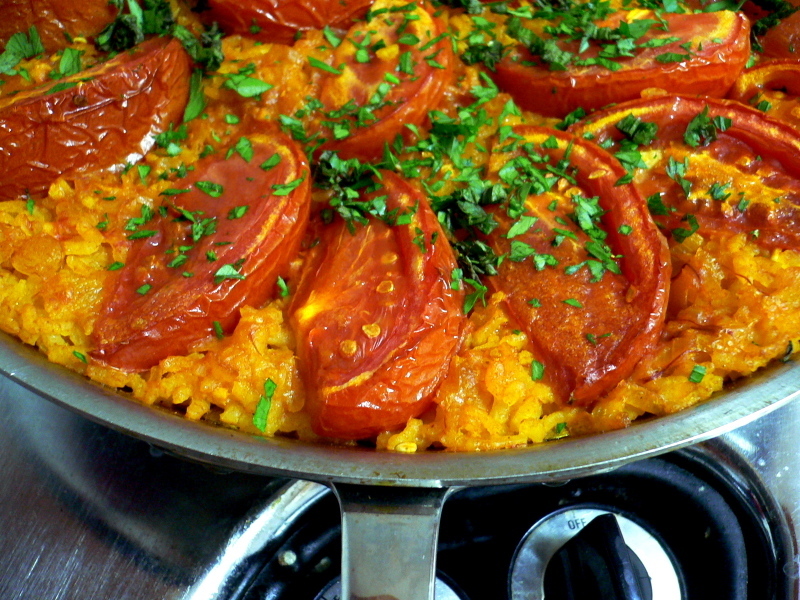 Put tomato wedges on top of rice and drizzle with juices that accumulated in bottom of bowl. Put pan in oven and roast, undisturbed, for 15 minutes. Check to see if rice is dry and just tender. If not, return pan to oven for another 5 to 10 minutes. 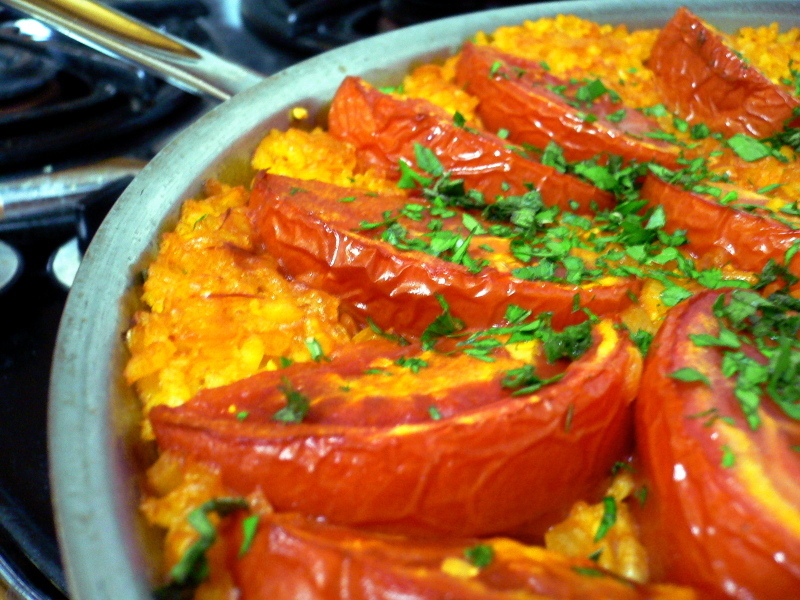 If rice looks too dry but still is not quite done, add a small amount of stock or water (or wine). When rice is ready, turn off oven and let pan sit for 5 to 15 minutes. 4. Remove pan from oven and sprinkle with parsley and basil. If you like, put pan over high heat for a few minutes to develop a bit of a bottom crust before serving.